Sabine Wren was a Mandalorian Human female weapons expert who was active during the reign of Galactic Emperor Sheev Palpatine around five years before the Battle of Yavin. She was also a graffiti artist who customized her armor and tagged a new symbol every time the crew of the Ghost struck Imperial targets. 1. Flight suit shirt should be a stretch material two-piece garment with the top being black with gray panels. Top must have short sleeves and a high collar that splits in the front. 2. Pants should be khaki with light brown panels and long enough to tuck into the boots. 3. Boots must be high enough to stop just below the knee, made of black leather or leather-like material, and fit snug to the wearer. Wedge heel preferred. Must be weathered and paint splattered to match references. 4. Chest Armor should consist of collar armor, right and left chest plates, and center diamond. Should be at least 3mm thick. Chest plates and collar plates should be painted fuchsia/maroon, center diamond should be red. 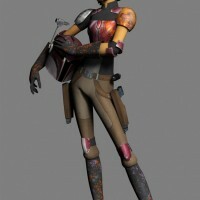 Left chest plate must feature an orange stylized rebel design to match references. Right chest plate must must feature two diagonal stripes painted to match references. All plates must be painted and weathered to match references both in color and weathering pattern. All armor must attach securely to the top with proper spacing. 5. Shoulder Armor must be at least 3mm thick. Must have four points and must curve around the upper arm and shoulder. Right shoulder must be white or light grey with a faded checker pattern. Left shoulder must be mottled orange with a stylized hound illustration in faded fuchsia/maroon. Must be painted and weathered to match references both in color and weathering pattern. 6. Knee Armor must be at least 3mm thick and painted fuchsia/maroon. Right knee must feature a vertical white stripe. Must be painted to match references in both color and weathering pattern. Should have the appearance of being attached by black straps wide enough to cover the knees. 7. Elbow Armor must at least 3mm thick and painted fuchsia/maroon. There should be two plates that appear to connect when the arm is straightened and separate when the arm is bent. Plates should be attached to a black band around the elbow. Must be painted and weathered to match references. 8. Boot Armor must be at least 3mm thick and painted fuchsia/maroon. Armor should be weathered and paint splattered to match references. 9. Gloves must be black leather or leather-like material. Must extend to a few inches below the elbow and be flared “gauntlet” style similar to X-Wing pilot gloves. Gloves should be weathered and paint splattered to match references. 10. Holster Belt must be a medium brown leather or leather like material that secures via metal rectangular buckle in front. Must feature 2 drop holsters with an angular design. Must have two metallic loops on either side of the belt buckle with the holster connecting between the buckle and the loop. Must feature two horizontal metallic loops where the holster connects to the belt in the back. 11. Holsters should hold 2 Westar-35 pistols similar to the ones seen in TCW. Must be a mismatched pair with one being painted blue, black, and grey, and the other painted grey, black, and yellow. Must be painted and weathered to match references in color and weathering pattern. 12. Hair or wig must be blue with orange wefts in front. Should be cut short and styled consistent with references. 1. Custom Mandalorian helmet. Dome, brow band and keyslots must be painted fuchsia/maroon. Upper cheeks must be painted medium-dark grey. Mandibles must be painted dark red/burgundy. The rear panels and lower cheeks must be painted light grey. The right ear must be painted light grey with a fuchsia/maroon oval. The left ear must be painted fuchsia/maroon with a raised cylinder painted light grey. The dome of the helmet must feature a stylized eye design who’s main color matches the mandibles, outlined in silver with an orange pupil. Must feature a metallic range finder stalk with a black rangefinder topper with a grey lens greeblie on top of the rangefinder. 2. Paint Sprayer constructed to match visual references. Must feature a red rocker switch on the front of the device; silver paint canister in the back; 5 round, silver push buttons on the left side. Must be painted, weathered, and paint splattered to match visual references. 3. A comlink device affixed horizontally to the left side (similar to TK comlinks in ANH). Reviewed on December 30, 2014.